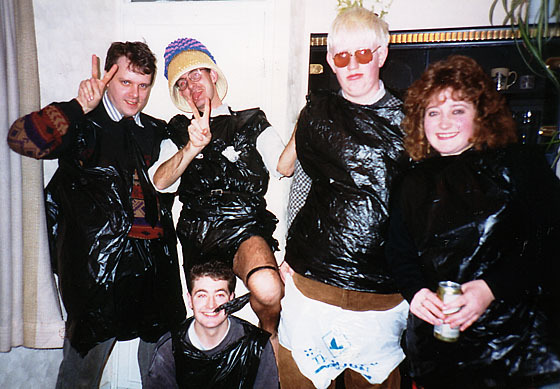 I can’t actually remember where the bin liner fashion first came from, but there was a time where Bin Liners were worn a lot. The picture here was taken at a party at Wendy-woo’s house in the winter of 93/94. The Git for some reason has removed his trousers and is wearing a bin liner garter as well as a waste bin topped with a tea cosy on his head. Nookie has a pair of carrier bag underpants worn Superman style over his trousers and Malibu Mel has a drink in her hand… no surprise there then. Dave, who for some reason is crouching on the floor, was not a Waffledale member at all, but a mate from the nearby Harrogate group. The hand gesture being given by Nelly and The Git is not rude at all, nor is it the Churchillian ‘V’ for victory sign. No, it is of course the “V” for Victor sign – The Waffledale symbol of maturity – Victor being Victor Mature. At this particular party we did wander off down to the local take away for some much needed refreshment. This involved going past a house which was for sale and had a ‘For Sale’ board outside… which was appropriated by The Git and carried along with us into the Take-away, which didn’t go down too well with the staff. Well, what would you think when confronted with a set of drunken people wearing bin liners and carrier bags and carrying a ‘For Sale’ board ? We did manage to persuade The Git that Wendy-woo didn’t want the sign in her house, so he stuck it in the hedge of the house on the corner of her street. Ah! Dave from Harrogate group. I do remember him!